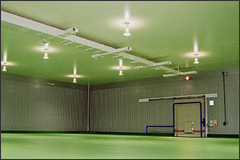 Low temperature logistic warehouses for agriculture. These have systematic construction and are earthquake-proof constructions. We specialize in building manufacturing plants from the planning & design stages. Using such high technology, we also build housing, and commercial projects.Our construction division also produce innovative construction materials such as insulator, welfare construction units for handicapped, and earthquake - proof construction units.